"We've been delighted with Virtua's performance in only a short amount of time." In the world of medical imaging, Puerto Rico-based Somascan is a shining star. In fact, many imaging centers would be proud to claim the wide range of high-end diagnostic imaging technology that Somascan offers, including 3.0-Tesla MRI, 64-slice CT, PET/CT, and digital subtraction angiography. As if that weren't enough, the 32-year-old San Juan conglomerate operates its own cyclotron, plans to acquire a new high-field open MRI system, may soon enter the world of 128- slice CT, and could soon provide positron-emitted mammography (PEM). With a strong emphasis on advanced technology, it's no surprise that Somascan has once again joined forces with another shining star, Middleburg Heights, OH based Codonics, this time to acquire the technology needed to record data-intensive diagnostic imaging studies onto CDs and DVDs. The acquisition of five ultra-fast Codonics Virtua© Medical Disc Publishers has reinforced the relationship between the two companies that began in 2004 when Somascan installed the first of five Codonics Horizon© Multi-media Dry Imagers. "Our success with Codonics and its Horizon imager was 90% of the reason why we acquired the Virtua systems," said Frank Kolodziej, M.D., president of Somascan. "We've been very happy with the Horizon units and had great confidence that we'd see the same success with the Virtua. We haven't been disappointed." Before acquiring the Virtua systems, Somascan relied on older technology to burn images onto discs. Those systems required more steps to operate, recorded studies slowly, were less efficient, and provided inferior labeling capabilities. A better solution was needed, so Somascan looked to Codonics and its Virtua recorder. "This device is useful for everyone, especially for our patients," Kolodziej said. "Virtua makes storing data easy and practical. It also makes transporting data to appointments with physicians much easier compared with films, which can be damaged in transit." Virtua can record up to 60 CDs or 30 DVDs an hour - up to one disc per minute. The recorder is specifically designed for high-volume imaging applications such as breast MR, PET/CT, MRA and CTA, and is the only device that can keep pace with multimodality environments, where individual imaging systems can create thousands of images per hour. All Virtua models feature a sleek, compact design that includes an advanced processor for receiving and managing studies, a robotic disc recorder and printer, and a world-class touch screen interface. The built-in printer produces brilliant, full-color disc labels that can be easily created by customers or with assistance from Codonics' label design service. Indeed, Virtua sets the standard for medical disc recording systems, burning customized discs that are ready to leave when the patient is - without any interruption in workflow. In contrast, Somascan's previous device recorded exclusively in a DICOM format, rendering discs virtually unreadable by patients and non-radiologists, Kolodziej said. However, the Codonics Virtua is more flexible, recording data in formats that may be viewed on any computer. Kolodziej said that most of the discs Somascan records are created for patients, who can store them at home and bring them to follow-up medical appointments if they wish. "We decided to switch to the Virtua in order to acquire a more universal recording system- one that would present DICOM data into formats that could be easily viewed by patients or any physician," Kolodziej said. "Now, any physician with a computer, not just radiologists who are familiar with DICOM , can view recorded images anywhere." Clearly, the Codonics Virtua and Horizon are perfect imaging center companions. The Horizon quickly and flawlessly prints highquality images onto film, color paper and grayscale paper, enabling Kolodziej to depict areas of interest as clearly and accurately as possible. The entire patient study may then be burned onto a CDorDVD that is professionally accented with customized labels which include the company logo and other full-color graphics. Complementing key images with the entire study on disc enhances communication between the clinician and patient while providing a marketing edge that other clinics simply cannot match. "The ability to print onto color and grayscale paper is critical to us," Dr. Kolodziej said. "Most physician practices in San Juan don't have a means of viewing films - doctors must hold the film up to a ceiling light in order to visualize it." He added that using Virtua to then record onto disc "has greatly improved our efficiency, and it has saved our centers a substantial amount of money when everything is considered." 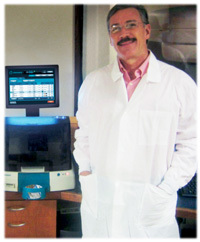 Kolodziej and his colleagues have found the disc capabilities of Virtua especially useful in treating cancer patients. A key component in evaluating cancer is the ability of physicians to compare prior studies. Virtua puts a high volume of imaging data on discs that can be easily stored, retrieved, and compared. According to Kolodziej, several studies and thousands of images may be recorded onto a single disc. If a patient loses a disc, or a partnering physician wants a copy, an additional disc can be created almost instantaneously. Virtua is also useful for cardiac studies, which often create large volumes of images. Using Virtua, all relevant data acquired in cardiac studies can be recorded quickly and easily, Kolodziej said. "In coronary artery studies, we often capture thousands of images," he said. "By narrowing the field of view and other parameters we can burn all the required data onto a single disc." While studies are usually recorded for patients, discs often are given to referring physicians. If a referrer has a question, the disc may go full circle and back to Somascan physicians for review. Using CDs and DVDs to store data, the movement of information between patient, referring physician and radiologist is smooth and simple. According to Kolodziej, the capability to record data onto discs as quickly, easily and dependably as possible improves workflow and results in cost benefits to practices as well. Digital data is always at the physician's fingertips, eliminating time-consuming searches through paper-based records. Additionally, the Codonics system is virtually trouble-free, eliminating costly down time. When records from unaffiliated practices are difficult to acquire, a disc brought in by the patient eliminates the need to track down images. And, the creation of discs is so simple that the process enables technologists to spend more time performing the clinical work they were trained to do. Finally, the high-quality labels that Virtua creates add an element of professionalism. "A good label gives the impression that our technology is up to date," Kolodziej said. "With Virtua, it is." There are other benefits. The purchase price of Virtua is comparatively low, operating costs are minimal, the footprint is small, and Codonics personnel are readily available to provide service and support if needed. "Even more important, however, is the clinical benefit that it enables. Virtua gives patients a record of their images, allows them to share that information with any physician, and enhances overall patient care. At Somascan, we've been delighted with Virtua's performance in only a short amount of time."